Huge Savings Item! 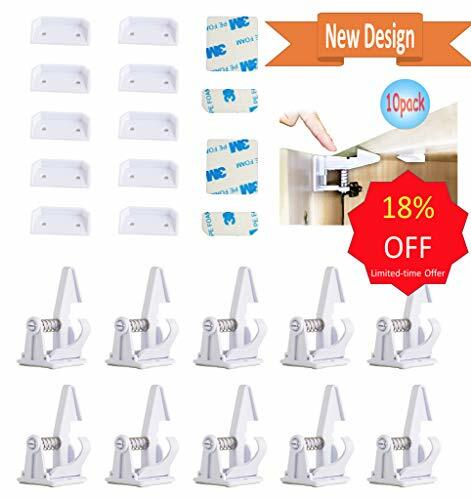 Save 18% on the Baby Proofing Cabinet Locks Child Safety Latches Invisible Design 3M Adhesive No Tooling, Drilling: 10 Pack White Drawer Lock for Baby Safety with an Anti-lock, 2 more Sets of 3M Adhesive by Chakrabit by Chakrabit at Defy Now. Hurry! Limited time offer. Offer valid only while supplies last. Baby proofing is easy with Chakrabit Cabinet Locks with its Invisible Design it stays Hidden . This Child Safety Latch are Easy to install. Baby proofing is easy with Chakrabit Cabinet Locks with its Invisible Design it stays Hidden . This Child Safety Latch are Easy to install. It has a very strong standard 3M Adhesive which works great . We are providing set of 10 latches. We know that there may be some mistakes while installing or you want to shift the lock to a new location, don't worry we are providing extra 2 Sets of 3M Adhesive . Keep your child Safe: Having child proof safety latches on the cabinets of your home will ease your fear of your kids getting into things like chemicals/cleaners that could harm them. These locks are easy to install and make you worry free! ❤️Safety and quality first: Chakrabit locks will not only protect your small children from potential dangers, they will also keep your child out of places where they'll find stuff to turn your home into a disaster! If you have any questions about this product by Chakrabit, contact us by completing and submitting the form below. If you are looking for a specif part number, please include it with your message.